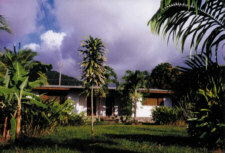 Our cottages are in a tropical garden with bananas, mangoes, coconuts, papayas, pineapple and many more. The six appartments all have running water, warm and cold, which comes out of a well in the mountains. 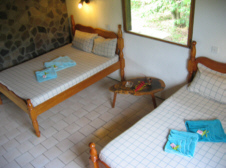 Besides a couch and armchairs there are two queen-sized beds (two persons each) in the cottage. In each appartment is a kitchenette (stove, refrigerator, table-ware, cutlery) and a bathroom with a shower and a water closet. From your Lodge, it is barely a few steps to the sea on the surfaced pathways through the garden. Sister Sea Lodge is nestled beautyfully in the centre of the Caribbean. So it's also ideal for families with children. 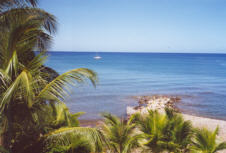 If you are a keen on diving, Dominica is your paradise. Below sea level, the views are breathtaking. 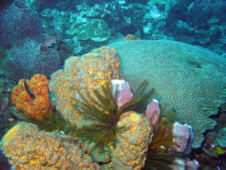 There is a whole variety of animals, corals and perhaps the odd pirate treasure... So: don't forget to bring along your snorkels! 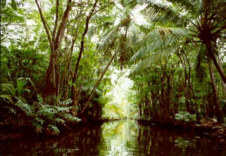 Or how about a trip on the Indian River? Leave all your worries behind and dip in to the »Garden of Eden«! Contact: call or mail us!